While it doesn't have the pungent aroma of baked gingerbread or the sweetness of the icing and candy, this gingerbread house and accordion book is a treat. I used the bottom of a grocery bag for the house and half the front panel of a grocery bag for the gingerbread men. You may want to glue your accordion into the house which I forgot to demonstrate on the video. Delightful story of the Gingerbread Baby's new friends with Jan Brett's always engaging illustrations. I find I spend more time with the pictures than the words in her books. I haven't tried the recipe but her description of the process fits what I learned (the hard way) in several years of gingerbread house construction. 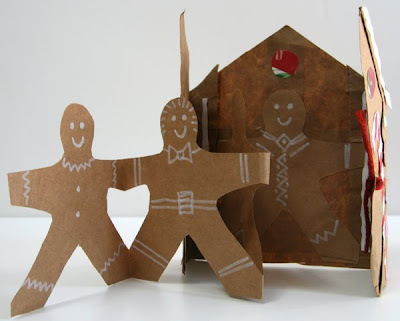 A little bit of the history of gingerbread by Alice Ross. Thank you, Susan, for the notification of your new blog address. As always, SO lovely and so inspiring. I can think of 5 little people who would like a gingerbread house. Thanks again. This is a darling idea. I featured it on my website. Love this! 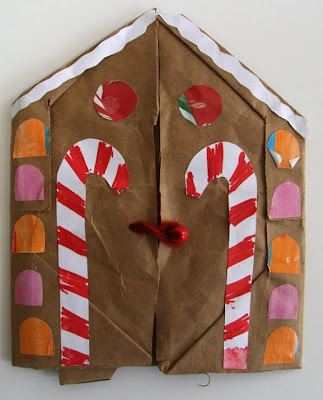 We are making these tomorrow with a Girl Scout Daisy Troop in West Newbury! I am a first-grade teacher and have incorporated your ideas into our classroom. The children are really proud of their work--so am I! Thank you for your great ideas. Thanks Dynette. First graders and books are a great combination! How cute! And great for all grandkids, including those with food allergies and intolerance symtoms. My grandkids and I love to use Christmas gingerbread foamies and stickers to make gingerbread houses and they are great for that as well. Thanks again for a lovely visit. SUPER IDEA!!! Thanks for inspiration!